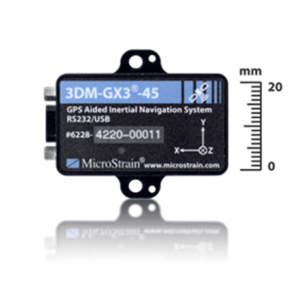 MicroStrain’s 3DM-GX3® -45 high-performance, miniature GPS-Aided Inertial Navigation System combines MEMS inertial sensors, a highly-sensitive GPS receiver, and a complex Extended Kalman Filter to generate optimal position, velocity, & attitude (PVA) estimates. It provides an ideal solution for a variety of applications including vehicle tracking, camera pointing, antenna pointing, and unmanned aerial and micro vehicle navigation. Additionally, its ability to integrate third party GPS and/or heading sensor inputs means that it can take advantage of existing navigation components that may already be in place. Learn more about this product here.